This week we’re bringing you a mouthwatering Goatsbridge trout recipe from Katia Valadeau, author of the Recession Bites food blog. 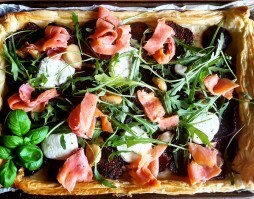 Katia has combined our Rainbow Trout with beetroot, roasted garlic, puff pastry, spicy rocket and Knockdrinna goats cheese to create a special dish we hope will inspire you. Preheat the oven to 180ºC / gas mark 5/6. Peel and slice the beetroot. They need to be about 3 to 5 millimeters thick. A neat trick when you’re handling beetroot is to rub your hands with a little bit of oil to avoid staining. Place your beetroot in an oven dish with the bulb of garlic. Sprinkle over the chili and drizzle with olive oil. Pop the dish in the oven and check in after 30 minutes, removing the garlic bulb. If the beetroot are still too firm for your taste leave them until they are cooked through. This shouldn’t take much more than another 15 minutes. In the meantime, place your pastry on a tray and prick the bottom of it. Weight it down using baking beans (or just some lentils on top of baking parchment) and cook the pastry blind for 10 to 15 minutes or until it has started puffing but is still uncoloured. Take the pastry out of the oven, and remove what you used to weigh it down. Start layering the beetroot slices. Add the sliced Knockdrinna goats cheese. Take the skin off the roasted garlic cloves and scatter over the top. Place back into the oven for a further 10 to 15 minutes. Remove the dish from the oven and let it cool down for a few minutes. Add a handful of rocket, then shred some Goatsbridge smoked trout over the top, adding a tiny squeeze of lemon juice, before drizzling with olive oil. If you liked this special Goatsbridge Trout recipe, you can buy our smoked rainbow trout from our online shop here or in all good Irish supermarkets, including Supervalu and Dunnes Stores as well as specialist shops around the country .